This enhancement of our best-selling allround blade has a slightly modified plywood composition and still offers an excellent control. FIREWALL PLUS enables a dynamic offensive game with reversed rubbers or short pimples. The ball can be accelerated easily for both hitting and looping thanks to its balsa core. 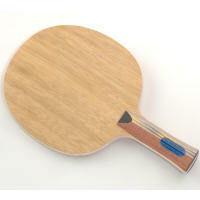 This blade also offers a very good feeling for all passive strokes. It produces high spin reversal and fast attacking possibilities through aggressive pushing or lifting when used with long pimples.